Now that you have acquired what is considered the best pistol grip of our day, extend your arms out from your centerline more or less equally, with the sights lined up, ideally under the dominant eye. Dominant eye you say? Yes, just as you are right or left handed you also have a dominant eye. We will address that at the start of Lesson 3. The stance we are seeking for this lesson depends on our goal. My primary goal is to be an excellent defensive handgunner. Toward that end I seek a stance that will allow me to fight effectively. 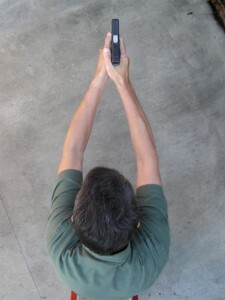 Some have described this position as a boxer’s stance or an athletic stance. Ideally, your feet should to be about shoulder width apart with your dominant side foot slightly to the rear. More of your weight needs to be on the balls of your feet. Your knees should be slightly flexed and not ridged.We like a slight forward lean that helps to control the recoil when the handgun is fired. The points of your hips should be facing the target. 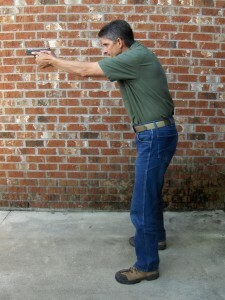 From this foundation, with the gun in hand, extend your arms along the centerline of your body. I prefer to keep my elbows slightly bent and do not like to lock my elbows out. This helps control recoil as well. Your stance should provide a comfortable, relaxed, stable platform from which to shoot. Additionally, your stance should support your ability to quickly move off the line of attack should the need arise.